Chicken in a pot. Not a very romantic name, I’ll admit. Luckily, the French have the more melodic “poule au pot” to fill that gap for this utterly delicious dish. But however you say it, chicken in a pot is a traditional French country dish that dates back to Henry IV in the 17th century. You see, he apparently promised that during his reign everyone would be able to afford chicken in a pot on Sundays. A few hundred years later, this idea was revived in American politics when Herbert Hoover’s presidential campaign promised a chicken in every pot, and a car in every garage. Monarchs and presidents aside, you need to learn this simple and fantastic recipe. The traditional version of chicken in a pot consists of a whole stuffed chicken poached with vegetables. All of the ingredients contribute to a rich broth, which then is served over the chicken and vegetables, often garnished with pickles, mustard and coarse salt. But truth is, most of us won’t bother with the stuffing. And that’s a good thing. Because then this becomes a lean dish, one well suited for the new year as we try to recover from the excesses of the holidays. Given that all animal protein becomes tough when boiled, the key to success in this recipe is to cook the chicken gently, ensuring that it stays moist and tender. In my recipe, the chicken simmers softly for just 25 minutes. Then, pulled off the burner, it finishes cooking in the residual heat of the broth. 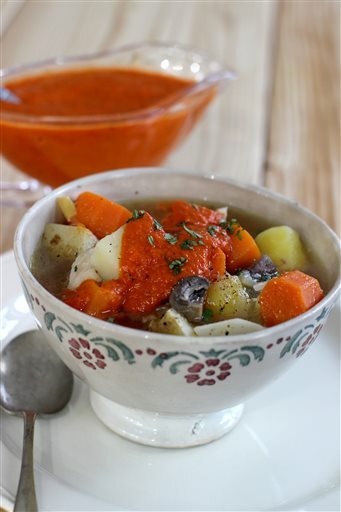 The vegetables are cooked afterward in the same broth. Finally, the chicken is skinned, deboned and returned to the pot in large chunks, but only to be reheated, not cooked any further. All of this care pays off in the finished texture of the star of the show. Rubber chicken is a dish only a comedian could love! In terms of seasonings, I’ve taken this French dish to Morocco, adding ginger and harissa, a hot chili past from Africa. I serve it with country bread, toasted and rubbed with garlic, though you’re welcome to ladle the chicken and vegetables onto couscous instead, which would complete the Moroccan theme. Whatever you decide, this is a wonderful dish to serve to a crowd. To prepare the harissa, in a blender combine all ingredients and blend until smooth. Set aside. Can be refrigerated for up to 3 days. 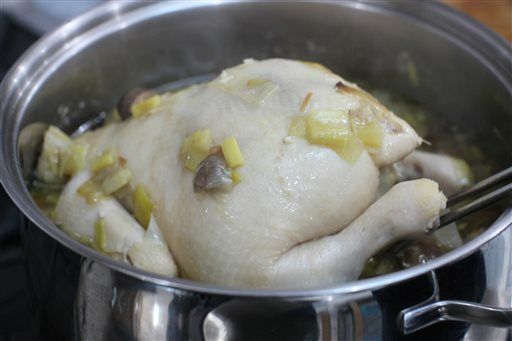 To prepare the chicken, in a 7- to 8-quart stockpot over medium, heat the oil. Add the leeks and cook, stirring occasionally, until softened, about 3 minutes. Add the mushrooms and cook, stirring occasionally, for 5 minutes. Add the garlic and ginger and cook, stirring, for 1 minute. Add the chicken, breast side down, then pour the broth over it. The broth should cover the chicken. If not, add a bit of water or additional broth. Bring the broth just to a boil, then reduce the heat and simmer, skimming any scum that comes to the surface, for 10 minutes. Cover and reduce the heat to simmer gently for another 15 minutes. Turn off the heat and let the chicken sit in the hot broth, covered, for 30 minutes. Carefully remove the chicken from the pot and set it on a plate. Let it cool until it can be easily handled. Add the carrots, parsnips, turnips and potatoes to the broth, then bring to a boil. Reduce the heat to a simmer and cook, covered, until the vegetables are just tender, 12 to 15 minutes. Meanwhile, pull off and discard the skin from the chicken and remove the meat from the bones in large chunks. When the vegetables are tender, return the chicken meat to the pot and cook gently, just until heated through. Season with salt and pepper to taste. 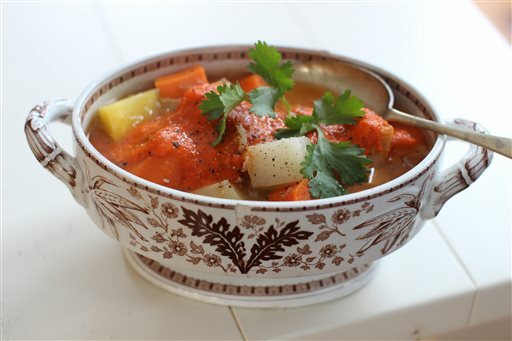 Ladle the soup into soup bowls and top each portion with a spoonful of harissa and some cilantro.